I woke up at 630am and called Anna, it’s her birthday today and here I am in Beijing lolling around a fancy hotel like a terrible person. I checked out the gym downstairs and lumbered away on the treadmill for a bit before meeting up with Justin for a buffet breakfast. We lingered over piles of awesome food for a while and headed to the subway to visit Tiananmen Square, we thought we’d just pop by and have a little looksy along with thousands of others who have the same idea every day in Beijing. Tiananmen Square was a vast grey space fading into the smog. 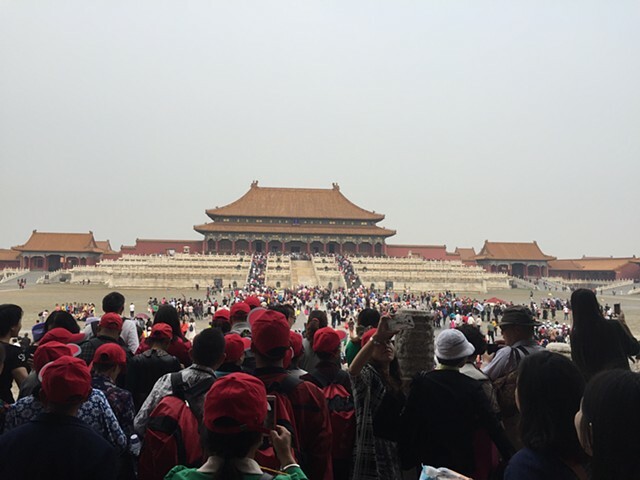 We made the long haul through the Forbidden City, streaming through with a few thousand tour groups. We saw a bit of fancy marching with bayonets, a forest of selfy sticks and endless throne rooms. It’s a vast city within a city, the big bronze lions are the best I’ve seen and the crowds are an endless sea of human beings. It was another spectacle on every level. We emerged out the other end and jumped in a motorbike taxi who took us weaving through the traffic, against the flow, down footpaths, through pedestrians and got us into the middle of nowhere before telling us that of course he meant $30 US, not 30 yuan. We’re such tourist suckers but I was glad to escape that human throng and it was still cheaper than a taxi at home. We got to Lama Temple and wandered through the hutongs there, not super interesting, they look cool but it’s a real tourist strip. Joanna had sent through a bunch of suggestions and we got a taxi to the Yangmeizu Hutong which was heaps better, packed with stuff. We walked back to hotel for a break and I managed to have a fun ordeal of getting an iron sent to my room after wrangling housekeeping with my non-existent Mandarin, except it was broken and spilled all over the bed and blah blah blah, poor me in my fancy hotel trying to iron my fancy shirt for the fancy opening tonight at the fancy Opposite House hotel. Anyway, we jumped into another private car and crawled our way through peak hour to the opening of Beijing Design Week and Lisa Roet’s Golden Sneezing Snub Nosed Monkey installation. It was an amazing 14 metre creature climbing the outside of the building. Super fancy! It was great seeing Lisa again and we met a bunch of people from DFAT, ABC and other Australian artists. Afterwards we all went for dinner at an Italian place nearby and I chatted to Joe Hamilton, a killer artist from Melbourne here for the New Media Biennial opening on Sunday. When we left it was raining hard and Justin magically found us a car and driver, I’m still not sure how he did it – this guy has some super powers! We got back safe and hit the sack.